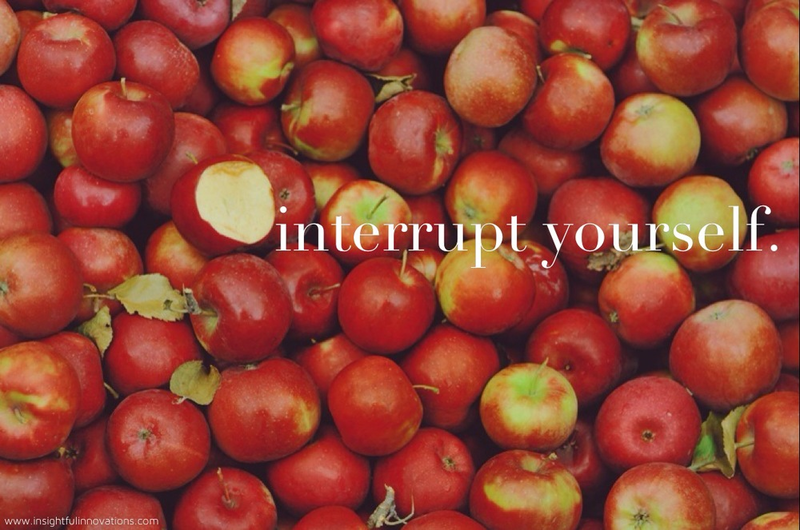 The idea of interrupting patterns is an important spiritual concept because many, if not all of us, need our habitual patterns interrupted from time to time. When I work with clients I tend to first spend a good deal of time figuring out what their patterns are (psychological, daily life, emotional, energetic) and then we can move to discovering ways to interrupt and sometimes even destroy those patterns to foster emotional and spiritual growth. Interrupting our patterns is a beneficial process because if we allow our habitual patterns to become too entrenched we get lost in the cyclical nature of a pattern's movement. If we have a pattern of falling in love, idealizing our partners and then slowly pushing them off of their pedestal and we continue to live out the pattern again and again without interrupting it (which usually requires looking at the patterns origin) we will continue to repeat it in perpetuity until finally, the pattern becomes so dysfunctional it causes disease or crisis, kind of like the cancer cell I mentioned earlier. This process follows a universal law. There cannot be order without chaos. Patterns, as a general rule become ordered when they repeat more than once. The first time something happens it's not necessarily a pattern but a tendency. Once it is repeated it then has the potential to become a pattern. By the third time it happens it is a pattern and the chance of repeating the process multiplies exponentially. Patterns represent order because there is a predictability, and that which is predictable is ordered. Even if the pattern itself seems on the surface to be chaotic, the fact that it repeats reveals an order. This is the basis of chaos theory. Human beings like order. They crave it. Even the most chaotic of individuals end up creating order out of their chaos. There can be a predictability about their unpredictability. It's quite funny to talk to people who think they are very spontaneous and then talk to their loved ones who begin to predict their unpredictable behavior. When someone is unpredictable and frenetic by nature they often attract those who represent order which for them feels like chaos, because it is interrupting their normal pattern of frenzy. Is your head spinning yet? When something has become repetitive, particularly if its process is somewhat damaging to the psyche, it will have to be interrupted by a chaotic or unpredictable event in order to be stopped. Many times one can interrupt the pattern by bringing awareness and then making a conscious decision to shift the pattern into something different. Preferably that something different is renewing and not damaging, but sometimes people need further damage in order to move into renewal.Many times people become so habitually ingrained in their patterns that breaking the pattern can be highly anxiety producing. When people seek the aide of a counselor, mental health clinician, spiritual mentor, coach or some other force whose aim is to usher in perspectives or insights that one has not considered they are helping to interrupt the habitual patterns that can have long-lasting effects on our lives. Many times these aides merely serve to shine light on the patterns that become difficult to see when you are an integral part of the patterns survival. Some of these aides, particularly if they are energetically aware, can help to shift the energy of a pattern while simultaneously bringing light. This is the benefit of working with those who work on multiple holistic levels. However, if a pattern has not become entrenched or dysfunctional there may still be an opportunity for you to interrupt the pattern on your own. Look at the events of your life that seem to be happening over and over again. Are there events where you say, "why does this keep happening" or "Of course...this always happens". That's where the potentially dangerous patterns may be residing. Feel the energy of the pattern when you are in it. If necessary think back to when you were last in the midst of a pattern and right down the emotional and physical responses you have in the pattern. If you feel a sense of constriction, tightness, fear, anxiety, sadness or the other oppressive emotions then the pattern is clearly damaging. Most patterns have an origin in our childhoods or early adulthood. Relational patterns can start as early as 2 or 3 years old, self-defeating patterns usually begin around the age of 5-7. Some patterns are familial and may have started generations ago. It could be something your mother, father or grandparents also did that you have now energetically and genetically inherited. It can help to write the story of the pattern down. If you pattern is an addiction like alcohol, think about whether the pattern began with you or a parent. Then discover what emotions or thoughts you are trying to quell by engaging in the addictive behavior. There's typically an avoidance of something when we adopt negative patterns. This could mean consciously making a different choice in the midst of acting out your habitual pattern. If you have a tendency to become irritated and defensive when someone criticizes you make a conscious choice to thank the person and allow in the criticism. If you're always attracted to the bad boy, give the good guy a chance. Change can come consciously or unconsciously. Sometimes unconsciously people invite change agents into their lives because they can't consciously seek the change on their own. Patterns have a way of sneaking back into our lives when we least expect it, and particularly when we are not living consciously. They also creep back in when we are comfortable. There's a fine balance between comfortable (and comfort for some people can be extreme chaos and emotional turmoil) and complacent. When we become complacent in our lives we often stop monitoring our potentially damaging thoughts and emotional responses. This is when old patterns can show back up, and before we know it, we're back in the thick of it.